Poklong Anading’s work questions and explores issues of identity, society, and happenings. He is a multi-awarded, Manila-based conceptual artist who creates photographs, videos, installations, and sculptures. In 2014, he was awarded the Philippine Artist Residency Program (PARP) and had the chance to stay in Paris and La Rochelle in France for over a month. PARP is an annual programme organised by Centre Intermondes, Alliance Francaise de Manille, and 1335 Mabini Gallery. Anading has recently wrapped up Hit Or Miss Is A Hit, which showed at the Alliance Total Gallery in Manila from 6 February to 13 March. In this interview, Poklong Anading talks about his experience as a resident artist and his creative journey from Manila to France and back again. In 2014, Poklong Anading was awarded the Philippine Artist Residency Program (PARP) and consequently spent time in France in September of the same year. PARP, an annual collaboration between Centre Intermondes, Alliance Francaise de Manille, and 1335 Mabini Gallery, provides Filipino artists the opportunity to live in France and French artists to stay in Manila for up to two months while developing proposed projects. Filipino residents are then invited to exhibit at Alliance Total Gallery in Manila, a space that doubles as a gallery and café. 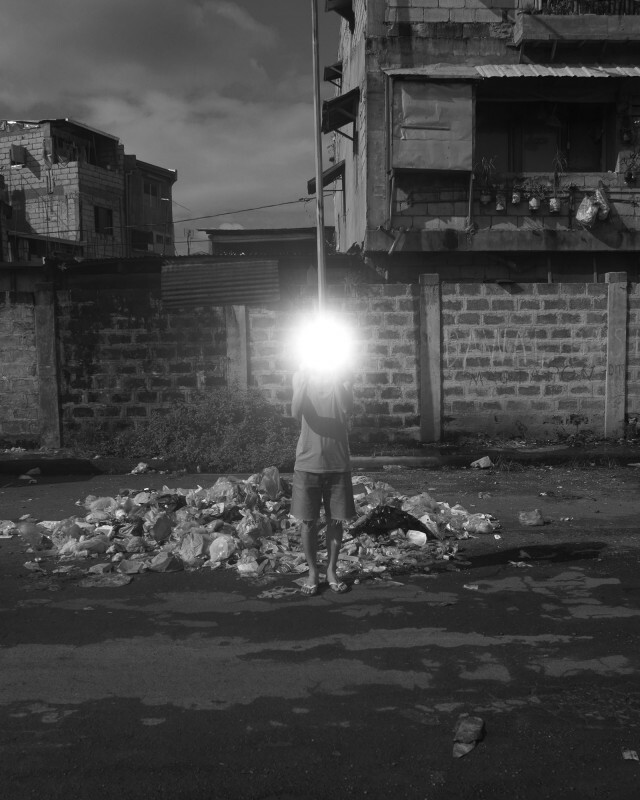 Anading, a Manila-based conceptual artist, creates photographs, sculptures, video, and installations. He has won awards such as the prestigious Cultural Center of the Philippines (CCP) 13 Artists Award in 2006 and the Ateneo Art Awards in the same year and again in 2008. His photographic series Anonymity, was the recipient of the 2007 Silverlens Foundation Acquisition Grant. A work from this project, Counter Acts (2004) has also been acquired by The Solomon R. Guggenheim Foundation. Anonymity’s themes around identity, society, and happenings can still be detected in Anading’s more recent works. Hit Or Miss Is A Hit, which showed at Alliance Total Gallery in Manila from 6 February until 13 March, was the culmination of Anading’s works after his residency in Cité Internationale des Arts (Paris) and Centre Intermondes (La Rochelle). It featured an overview of his past exhibition in France, Digging Bells with Cannons, as well as new works. Among those displayed are video projections, photographs, and tables. ASEF culture360 contributor Lai del Rosario chats with Anading about his experiences as a traveling artist and follows his creative journey from Manila to France and back. I noticed that you have done residencies in Indonesia, Thailand, Australia, China, Manila, and now France as part of PARP. What is it like to be an artist-in-residence? In each art residency I have been part of, the situation is always different and that is a challenge to me. There is so much familiarity as well as strangeness every time I move around. I think residencies are good because they allow artists to explore places, meet people, and see something they will not normally see. At the same time, my residencies are very short stays that last from three weeks to three months. It is challenging to learn something during such a short time. How are your works affected by your environment? We are always influenced or affected by the places we inhabit. Each place has a specific context. When I travel, the kind of relationship I have to new places also changes. What seems to be constant is the presence of a structure - a network holding traffic of different flows and flaws. This kind of environment seems to inform my mode of action and production. When I am in a new place as a temporary resident, I begin with a series of walks. During this walk, I may gradually collect and observe some patterns that make up the foreign surrounding. When I am moved by something, I try to let go of my natural response and instead make a series of experiments as a point of departure from a previous experience. This may evolve or change depending on the condition I am in. It is a learning process. Your exhibition in La Rochelle, Digging Bells with Cannons, was a makeshift camp evoking roads under construction. What led you to this idea? Part of my proposal for PARP was to have at least a month of exploration in Paris to visit some museums. One of them was Musée des Égouts de Paris, the city’s sewer museum, which has been problematizing the sewer system in Paris since the early 11th century. Knowing very little about where water goes, I started following the water in the city. How does the filtering work? How does the structure of this system look - the channels, the network of lines connecting different households, restaurants and other industries? I was inspired by the idea of an underground traffic. These thoughts, along with my observations on the never-ending reconstruction of roads in the Philippines and abroad, resulted in an installation evoking a makeshift camp. I realised this concept into a kind of ‘stopover platform’ that makes us pause and think about the reconstruction of thoughts happening within a space. Using works from past and on-going residencies, I tried to show paths of water, such as rivers and seas, canals. I used the same idea of channeling water in my return exhibition in Manila through dining tables inspired by the shape of a manhole. Let us move on to your show in Manila, Hit Or Miss Is A Hit. How important is the context especially for an artist whose works are constantly being shown in different places? Context changes all the time especially in a multi-functional space. The exhibition at Alliance Total Gallery was not a typical space. 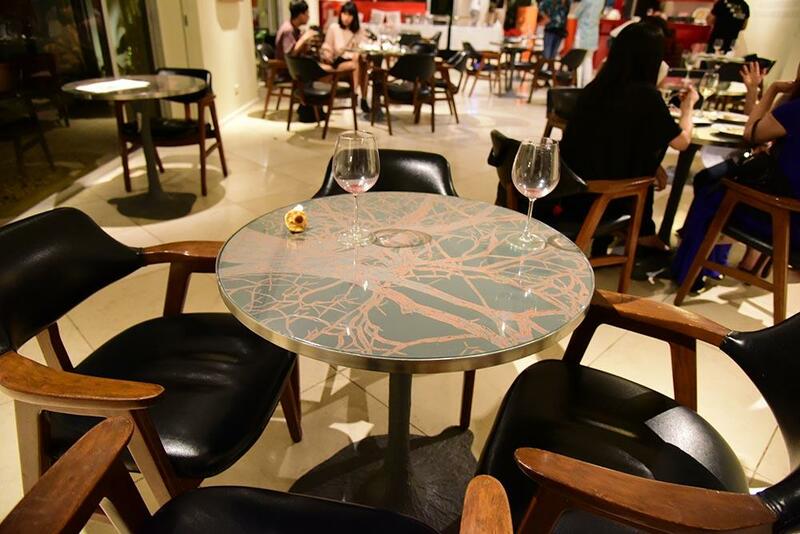 It was a gallery but also a café that hosts a varied crowd. I wanted the audience to become part of the show whether they realised it or not. Through the tables, it was as if people were communicating and dining over manholes. The exhibition included photographs of anonymous people taking ‘selfies’. What was your inspiration for this project? The idea was conceived during my art residency in Bangkok while visiting some shrines and temples. It further developed after visits to different museums, particularly to the Louvre in Paris. I noticed that visitors took more time taking photographs of themselves with the artworks, almost to the point of replacing the actual experience of looking at the real thing. For me, this phenomenon becomes an event in itself, which I allow myself to be part of. 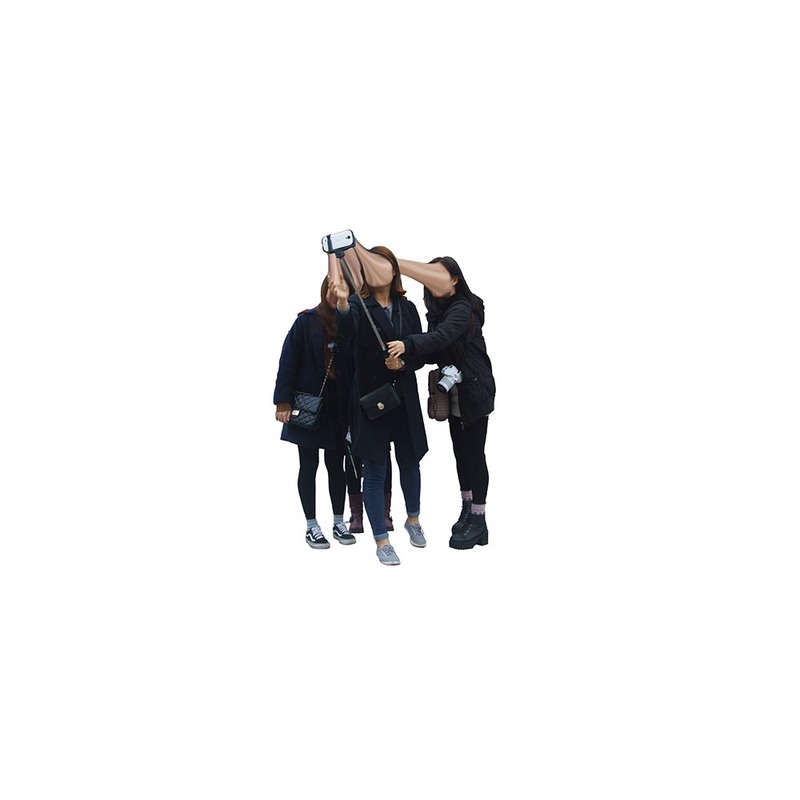 I decided to capture the simple act of remembering by photographing people taking ‘selfies’. The idea reminds me of the Anonymity series. Since I started doing Anonymity, I have been trying to make a mark. I try to connect with people I encounter, have small conversations with them. The practice helps me to go to another place. The people I meet intentionally or unintentionally become markers of connections, though within a very short period of time. One of the photographs in the exhibition, Triangular Forces, shows people on top of round pedestals right outside the Louvre. 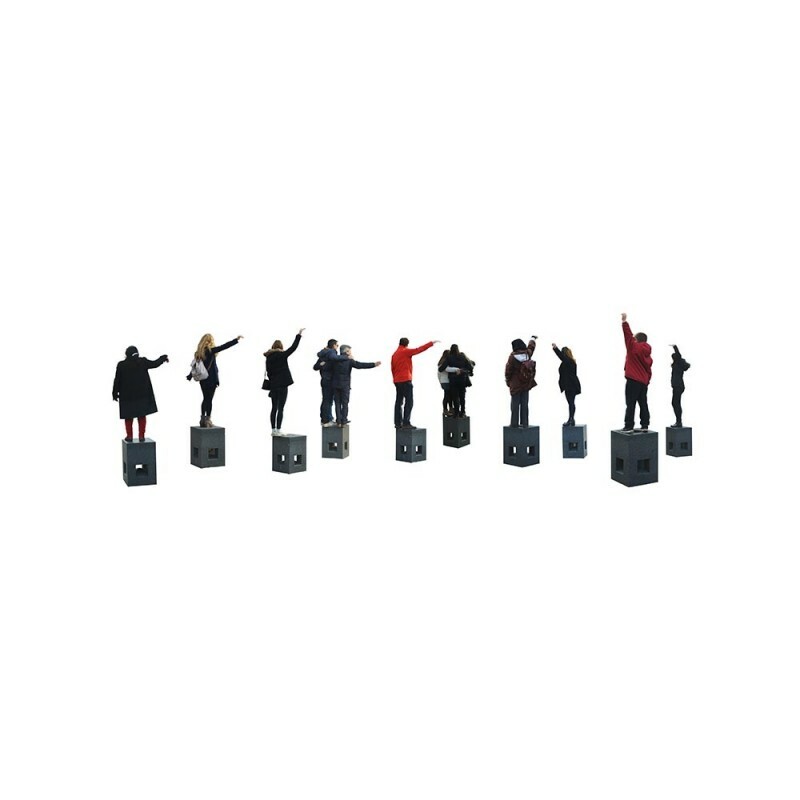 I do not know the exact function of these pedestals, they seem to be an abstract stage for people to stand on and pose as if they were performing a particular act. It seems the people were trying to measure the height of the Louvre pyramids by leaning on space and making poses. I like how we can be inspired by certain structures or icons because they are different from what we know. Many of your works explore issues of identity. Why this interest? Identity is a never-ending topic. The more the issue regarding it is being discussed, the more the argument intensifies and becomes more problematic. I wanted to start on a clean slate and free oneself from the limiting aspects of identification, allowing the viewer to other possibilities of seeing. What about making long-term connections beyond the residency? During my residency in Paris, I met many other artists from London, the United States, Malaysia, etc. In fact, our residency inspired us to create another project so that we, along with other artists who have done residencies, can share our experiences. We are thinking of creating an archival collection such as documents, paintings, drawings, texts, etc., and share these works through libraries all over the world. The project is currently in the process of development.